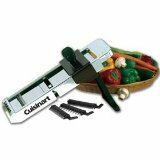 The Cuisinart Stainless Steel Mandolin Slicer is an efficient professional tool that is perfect for creating decorative salads, potato chips, french fries, cheese platters and more. The durable stainless steel frame and reversible sliding blade makes waffle and straight cuts. There is an easy to use safety guard for safe and accurate slicing. Dishwasher safe and easy to clean, plus a 5 year limited warranty.